Arguably the most sought-after of the classic aft cabin cruisers, Carver’s 4207 Aft Cabin Motor Yacht features large forward and aft private staterooms – the time-tested, perfect configuration for extended cruising with guests aboard. The aft stateroom has a queen-size berth, two full hanging lockers and private head compartment with shower. A forward stateroom has a double berth with direct access to the guest head with shower. With a 15’ beam, the main salon and galley areas are spacious, bright and inviting. The salon is equipped with wet bar, entertainment centre, sofa/sleeper, breakfast bar and two of the most comfortable lounge chairs on the planet. A very well-equipped galley sits opposite a beautifully upholstered, raised, U-shaped dinette. Hardwood flooring throughout, Persian area rug and hand-finished teak woodwork, are the finishing touches to a classic picture of luxury and elegance on the water. But luxury below decks is really only half the story. The 42 Aft Cabin has a completely enclosed, hardtop aft deck, equipped for casual entertaining with convenient wet bar, refrigerator and ice maker. Port and starboard wing doors open to wide side decks providing safe access to the foredeck area, which includes a large sunpad/lounge. Just a few easy steps up from the aft deck, the command bridge is equipped with a fully instrumented helm and comfortable seating for up to seven. Structural integrity is a major concern when purchasing any boat more than five years old. It can be the source of much grief, and needs to be carefully assessed during the purchase process. Grid stringer systems are the structural backbone of most fiberglass boats, and are often constructed of wood encapsulated in fiberglass. Carver was one of the first manufacturers to move to solid fiberglass stringer systems (reinforced in the engine room with aluminum), and to solid fiberglass hull construction from the waterline to the keel. As a result, chances of this boat requiring structural repairs due to moisture intrusion are greatly reduced, at least in the hull areas most difficult and costly to address. Anyone previously faced with a stringer repair bill will appreciate this critical, but often overlooked detail. The long-time owners of this traditionally styled home on the water are regretfully retiring from boating, and are including numerous extras as part of the package. 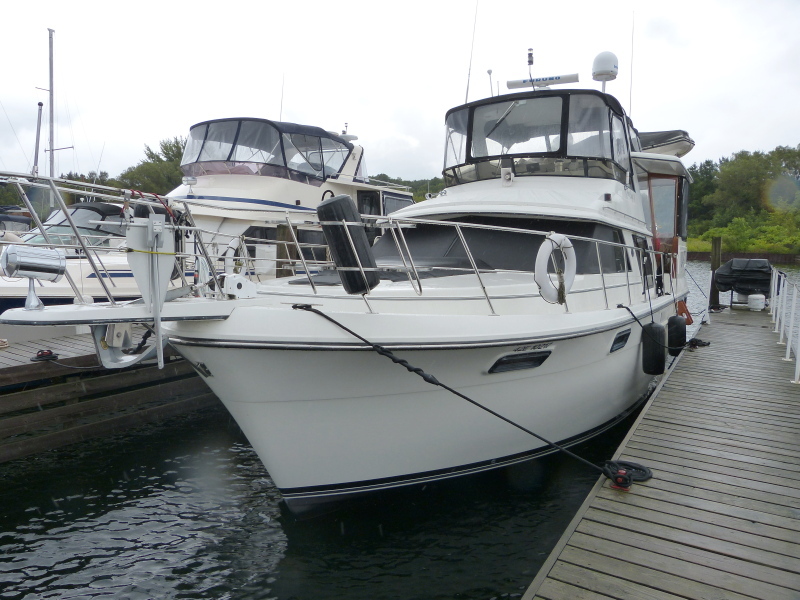 Experience tells us this well equipped aft cabin will sell very quickly. Call today for a viewing appointment before she’s snapped up.